On 3 July Belarus celebrated its official Independence Day. Many Belarusians felt frustrated despite a military parade and festivities to celebrate the achievements of the national economy. While Alexander Lukashenka branded the parade as “the best” in Belarus’s history, Minsk residents complained of traffic jams and damage to public roads. In both Minsk and other centres, local authorities have traditionally celebrated Independence Day with displays of what they considered the most important achievements of the Belarusian economy, showing off refrigerators, washing machines, hospital equipment and tractors. So, what did Minsk’s streets endure on 3 July this year? 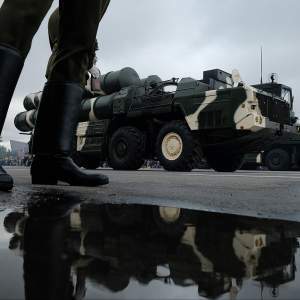 About 250 military vehicles took part in the parade, including multiple-launch rocket systems (Smerch, Grad, and Polonez) and anti-aircraft missile systems (S-300 PS, Osa-AKM, and Tor-M2). As well, T-72 B battle tanks, BMP-2 infantry fighting vehicles, and BTR-70 family vehicles also rolled through the streets. As has become tradition, the legendary WW2 T-34-85 tank led the convoy. The hundreds of armoured vehicles put colossal pressure on the roads, leaving numerous cracks in the asphalt surfaces. Each year, after military parades, Minsk’s residents share pictures of tank tracks and bumps left on the roads. In 2017 more than 9,000 Belarusians signed a petition against military parades in the centre of Minsk. Among major complaints, they listed ecological damage, excessive noise, traffic jams, and road damage. To date Belarusian state officials have downplayed public concern about road damage and other inconveniences caused by annual parades. The Ministry of Defence emphasises that military parades take place in accordance with the decision of the President of Belarus and with the full support of the Belarusian people. The Ministry of Defence adds that the potential relocation of any annual military parade would significantly raise its costs. Dzianis Glinsky, the head of the capital’s road administration, rebutted claims about road damage caused by armoured vehicles. 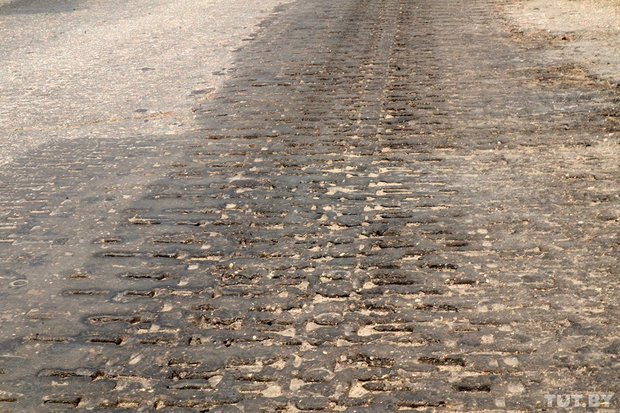 According to Glinsky, tank tracks hardly constitute a danger to the capital’s asphalt and concrete surfaces. A risky show funded by taxpayers? Despite optimistic affirmations from top Belarusian officials about the parades’ popularity with the general public, each year Belarussians discuss them in a negative context. First, the use of a large volume of military equipment inevitably leads to incidents. In June 2017, during a parade rehearsal, a tank hit a lamppost on one of Minsk’s central streets. The video of the incident has garnered significant attention and collected more than 754,000 views on YouTube. In June 2018 an infantry fighting vehicle near Hrodna accidentally crashed into a passing car, injuring the car’s driver. The incident led to the heated discussion of parades’ feasibility across Belarus. Expenditure on military parades also raises concerns. Since the Ministry of Defence has not divulged parades’ costs, several analysts have attempted to estimate their budget independently. Naviny.by reported that Belarusian taxpayers paid approximately $2.37 million for the arrangement of the 2017 parade. Analyst Aliaksandr Alesin provided another figure: in 2009, he claims, the military parade cost taxpayers about $50 million. Taking into account the reluctance of the Ministry of Defence to disclose the real figure, speculations about parades’ budgets will continue. The scenarios of the annual military parades annoy some Belarusians. The “carnival” part of the parades receives an utmost criticism. For instance, Belarusian internet users mocked the previous year’s parade, which featured Belarusian-made refrigerators, washing machines, and TV-sets as a demonstration of national industrial success. Amid criticism, the recent parade avoided showing off refrigerators and stuck to dancers and singers instead. Consequently, the feasibility of an expensive and sometimes dangerous display of the nation’s military power remains questionable for a number of Belarusians. Two weeks ago a popular newspaper, “Nasha Niva”, conducted a survey asking whether the celebration of Independence Day should involve a military parade this year. 85 % of respondents replied that it should not. Or a patriotic display of national unity? For Lukashenka, an annual demonstration of the nation’s military might serves to unify of the Belarusian people. The president maintains that the nation must see a battle-ready Belarusian army. According to Lukashenka, Independence Day’s parades must be “impressive” and their arrangement should “spare no resources”. In this way, annual military shows continue to remain a viable tool of the Belarusian state ideology with aviation, armoured vehicles, and missile systems as irreplaceable components. Globally, approaches to military parades vary from “spare no resources” to the utterly pragmatic. While the United States and the United Kingdom constrain themselves to soldiers and horses, the post-Soviet States traditionally engage armoured vehicles in parades. Hundreds of battle tanks and infantry fighting vehicles hit the streets of Moscow and Kazakhstan’s Astana on a yearly basis. In this way, Lukashenka’s intention to carry on with impressive parades despite the growing national displeasure looks in line with his neighbours’ policies. Armoured vehicles will, therefore, continue to roll through Minsk’s streets next year, resulting in additional cracks and tracks, much to the anger of the capital’s citizens. Olga Hryniuk holds degrees from Coventry University and the European Humanities University. She is based in Minsk, Belarus. 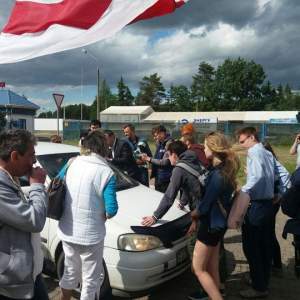 Since 31 May protesters have blocked the entrance to a recently opened restaurant outside Minsk. Built in Kurapaty, 50 metres from a memorial to victims of Stalin’s repressions during 1937-1940, the ‘Poedem, Poedim’ restaurant has caused heated debates. Conflict quickly erupted between business interests and the values of certain sections of civil society, while the state’s position remains unclear. The owners received permission from officials to build a restaurant near the Kurapaty forest, yet civil society representatives view the construction as morally unjustifiable and strive to preserve the sanctity of the Kurapaty memorial. The case of the restaurant illustrates a pattern of communication between business, state and civil society in Belarus. As has already happened with the nuclear power plant (NPP) project in Astravec and the reconstruction of the historical Asmalouka district in Minsk, civil society largely remains excluded from the discussion. The public learned about Kurapaty in the late 1980s, when excavations discovered evidence of a burial site for Stalin’s repressions victims. Zianon Pazniak, then the head of the Belarusian National Front political party, led the push for the installation of a memorial and fought for the right to publicly recognise Kurapaty as a mass execution site. The memorial in Kurapaty, which takes the form of wooden crosses, has become a traditional place for honouring ancestors, especially among the Belarusian opposition. Several times Kurapaty has come to public attention because of construction projects. The first scandal occurred in the early 2000s when authorities approved the construction of a ring road on the territory of the memorial. Dozens of activists camped out in tents so as to prevent access for construction machines to Kurapaty. A few years ago, the construction of an entertainment centre, ‘Bulbash Hall’, commenced beside the memorial. Activists protested against the ‘inappropriate’ name and lobbied for a change of the centre’s name as well as a ban for its construction. The protests reached the prosecutor’s office and construction on the site ruled as illegal. However, in 2012, the Minsk city executive committee diminished the protection zone in Kurapaty and construction of the entertainment centre became legal but under a new name – ‘Poedem, Poedim’. On 5 June the restaurant ‘Poedem, Poedim’ appeared close by to the Kurapaty memorial. Even before the opening it provoked a strong reaction among politically-active Belarusians. Since 31 May opposition activists have organised a series of protests. A dozen or so protesters blocked the entrance to the restaurant for visitors and chanted against the restaurant’s opening due to its location, 50 metres from the memorial Kurapaty. Instead of ‘Poedem, Poedim’, defenders of Kurapaty suggest erecting a museum to the victims of Stalin’s purges. On 29 June oppositional activist Zmitser Dashkevich initiated the installation of new wooden crosses but was detained together with two other activists. The situation continues to develop: oppositional activists protest every day. The restaurant owners insist they have bought the territory and own it, but also suggest they could sell the restaurant for construction of a museum as demanded by protesters. The authorities still avoid particular interference in the picket, although they have fined some participants for the blocking the road and detained activists for the planned installation of crosses. Apart from those physically protesting against the restaurant, the opening has provoked strong public criticism from some famous Belarusians. According to the Nobel laureate, Sviatlana Aleksievich, in any other European country hundreds of people would defend a comparable historical site; only Belarusians prove unwilling to take a proactive position. On 24 June, during a lecture in Brooklyn, Zianon Pazniak, the oppositional leader who in the 80s initiated the installation of the current memorial, claimed that the situation might have a Russian trace. Some have expressed the opinion that the restaurant has little chance to survive economically. Viktar Prakapenia, a famous Belarusian IT entrepreneur, in an interview with dev.by, said that each member of society has a responsibility to avoid visiting the restaurant. Moreover, he believes that the restaurant should be closed by the owners themselves on moral grounds. Jury Zisier, the owner of one of the biggest independent media in Belarus, TUT.by, claims that the restaurant has little chance to survive due to its location close to the only memorial of Stalin’s mass executions in the country. At the same time, some experts believe the restaurant should continue working. A lawyer, Yury Ziankovich, who wrote about the situation in Kurapaty believes the restaurant owners, state and citizens should compromise and come to a solution on how the restaurant and memorial can be linked together. Ziankovich told Radio Liberty that the restaurant owners bought the territory and preserve the right of ownership and so to turn it into a museum, as protesters demand, someone should buy the property from them. Despite wide discussion about the restaurant, the authorities hesitate to take a clear position although do demonstrate readiness to negotiate. According to the official response of the general prosecutor’s office, the restaurant did not violate any rules during its construction. However, the prosecutor’s office would review the documents on construction if a visible public concern exists according to Sputnik.by, which cites the prosecutor’s office. Additionally, on 20 June, Pavel Seviarynets, the leader of the Belarusian Christian Democracy party, negotiated with the Ministry of Culture. According to the activists, officials referring to the legal documents seem confused and still have no clear solution to the situation. Although the negotiations have barely simplified the situation, the talks between the opposition and the state on the issue show that authorities recognise an alternative point of view exists. Similar situations have already emerged in Belarus. The Astravets NPP project led to mass public discussion due to the absence of proper negotiations between state, business and civil society stakeholders. In yet another example, since 2014 the plan to reconstruct the historical Asmalouka district of Minsk resulted in protests because of the lack of public hearings. The situation with the restaurant in Kurapaty shows how civil society, business and the state interact in Belarus. On the one hand, the owners have received a right to construct a restaurant on the territory. On the other hand, the construction by the important historical site has never been discussed in public hearings. That raises the question of decision making in similar situations in the future. Excluding the civil society from the business-state communications, the Belarusian government will continue to face backlashes similar to the one in Kurapaty.